The success of Cathair Dhoire was never going to be judged on silverware. It won't feel like it to 2019's inaugural squad after Monday's five point Mac Larnon Cup final defeat to St. Patrick's Grammar Downpatrick but this year's achievement was always in providing a platform for city kids to play. And in that it has been a huge success. The sombre mood among the management and players as the filed out of the Athletic Grounds illustrated the hurt caused by the 1-11 to 2-13 loss but when that passes maybe these players will realise the important role they've hopefully played for future generations. In Lumen Christi, Oakgrove College and St Columb's, the Mac Larnon Cup exploits of Catahir Dhoire may just have sown a few seeds among the younger students, got parents talking and opened the eyes of even more to the potential of the sport in the city. That was its primary aim and these boys have set standards for others to now match and hopefully surpass. Critics have been plenty but, not for the first time, the final proved conclusively that Mac Larnon is the correct level to pitch the amalgamation at. Logistically, it has been a huge challenge for Conal Donaghy, Michael McCullagh, Michael McLaughlin and Paul Simpson and even reaching the final off the back of one training session a week is an achievement in itself. A breathless first half started at pace and rarely let up through a rip roaring first 30 minutes. St. Patrick's danger man Ruairi O'Hare came into the game carrying an injury which saw the Red High management move his from his usual midfield position into full forward and while they missed his drive from the middle, he caused no end of trouble for the Dhoire defence. Cathair Dhoire sprung something of a surprise themselves by playing captain Fergal Mortimer inside with Ben McCarron slightly withdrawn in the playmaker role. McCarron revelled, hitting four first half points but should also had had at least one goal as both sides opened the opposition up with fast paced counter-attacking football. Any fears over defensive football were dispelled inside the first 60 seconds. From throw-in Red High's impressive half back, Brandon Boyd, surged through to tap over with only 12 seconds on the clock. Thirty seconds later that lead was doubled, Niall Laverty this time the hard running supply line for Ronan Connor's point. But if Catahir Dhoire were shell shocked, they didn't show it and within three minutes the Derry City side had hit the front. Caahir McMonagle got the city lads up and running before Fergal Mortimer stroked over a '45'. When a throw ball was awarded 20 yards from the Red High posts, it was McCarron's turn to win possession before hooking a lovely finish over his shoulder for a 0-3 to 0-2 lead. And it should have been more. Inside a minute, McCarron was teed up for a goal only to be denied by a superb tackle by Red High's Lorcan Guinness as he was about to pull the trigger. The subsequent kick out presented an even more gilt edged chance as Shea Browne, racing down the left to square for McCarron, but the Derry under 20 score could only fist over the bar under pressure with the goal gaping. The point extended the Derry side's lead but with only seven minutes gone, the pendulum was about to swing once more. Red High's kick-out made its way to up the left where it it eventually found Tim Prenter. The Down hurling senior player cut inside before unleashing a fierce low finish at Matthew Stephenson's near post for a 1-2 to 0-4 lead. The two talismen, O'Hare and McCarron, swapped scores side swapped scores as Red high steadily built a four point gap with eight minutes of the half remaining. Catahir Dhoire were in danger of losing touch but produced a superb goal just when they needed it. McCarron superbly broke a Red high kick-out down for Shea Browne to release the charging Oran McGrath. McGrath had plenty to do but under pressure from two defenders still had the composure to fire a lovely low finish into the corner of the net to leave only one in it at 1-07 to 1-06. And that single point remained at half-time as the side traded score before turning around with the Downpatrick boys leading 1-08 to 1-07. Two quickfire point upon the restart from Tom Smyth and Ronan Connor gave Red High a three point cushion but again Cathair Dhoire found a response as points from McCarron, McMonagle and Mortimer levelled proceedings once more at 1-10 a-piece. 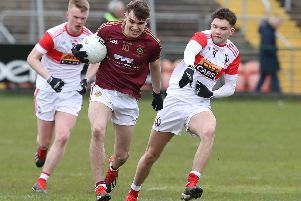 When Red high lost Smyth to a Black Card following a late challenge on Michael Lynch, the stage seemed set for the Derry lads but they were unable to push on. Instead Red high turned the screw, Ruairi Quinn, O'Hare and an outrageous point from Connor reinstating a lead they never looked like losing after with 14 men after a second yellow card for O'Hare. Cathair Dhoire battled but were forced to throw men forward and were caught by the inevitable break as full-back Eoin Rooney sent substitute Conor Murray away. Murray's pass to Prenter looked to have pushed him to wide but his first time shot caught everyone out, rolling agonisingly past Stephenson and into the far corner. There would be no way back. The Mac Larnon Cup was on its way to Dowpatrick and deservedly so but the longer term success could yet be Catahir Dhoire's if the city amalgamation continues to expose players to football of this level. Cathair Dhoire: Matthew Stephenson; Peter O'Flaherty, Naoise O Mianain, Michael Lynch; Jude Mullan, Shane McElhinney, Conor McLaughlin; Cormac Mooney, Oran McGrath; Shae Browne, Ben McCarron, Fergal Mortimer; Ryan Brown, Eoghan Cassidy, Cahir McMonagle. St. Patrick's Grammar School: Eoin Maginn; Jack Harbinson, Eoin Rooney, Lorcan Guinness; Peter McMullan, Ronan Murphy, Brandon Boyd; Ciaran Watson, Ruairi O'Hare; Tom Smyth, Odhran Cunningham, Niall Laverty; Tim Prenter, Ronan Connor, Tom Savage.